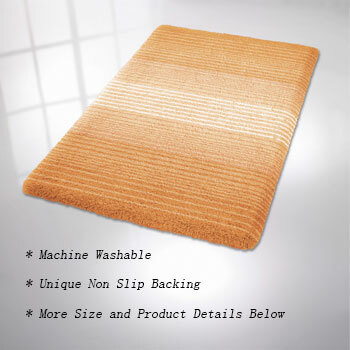 A beautifully finished bath mat with gradient colors. 100% polyacrylic fibers to retain color and style with a pile height of 25mm / .98in for extra comfort and a luxuriously soft feel. Gradient colors gives the design depth and dimension. Available in 6 colors (peach, pink, orange, green, blue, and grey) and 5 sizes.